Designed for smart phones and tablets, this app will help you manage your diabetes better and keep it under control. Whether you are type 1 or type 2, gestational diabetes have or just to help and follow a family member is the logbook application for you. The app tracks almost every aspect of diabetes treatment and provides you with detailed reports, graphs and statistics. You can send the reports to your supervising physician by email. 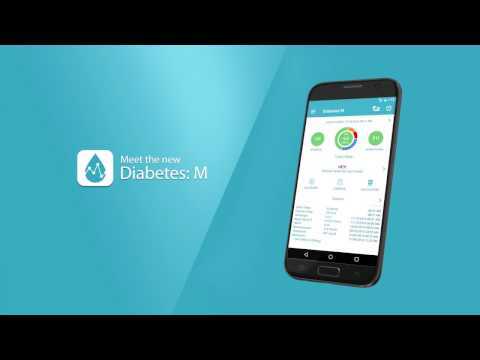 Diabetes: M also gives you various tools, so you can find trends in blood glucose levels and allows you to calculate normal and prolonged insulin bolus using its highly efficient, high-end bolus calculator. + Bluetooth Integration - connects to some of the most popular Bluetooth glucose meters. + 2 additional profiles - You can define two additional profiles, fully featured. This allows you to keep track of your loved ones (or even pets). + Pattern Analysis - advanced glucose analysis of logbook data with explanations of the causes of the most likely problem.